My team are currently working hard behind the scenes to launch a brand new betting challenge section of the website. 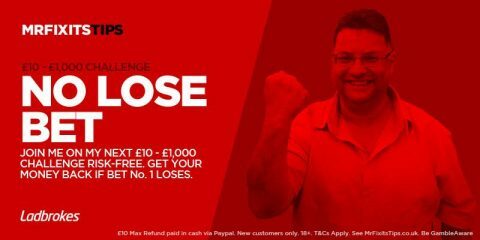 Expect to see the usual £10 to £1000 and inplay challenges as well as some new formats. We plan on running at minimum two challenges together, one for free members and another for VIP members. All member tiers can also get involved by submitting bet suggestions. See below for my previous challenges and follow me on twitter for updates. We expect to launch the new betting challenge section in early Q1 of 2019. Grab yourself the chance to have a risk-free go at Mr Fixit's latest £10 - £1,000 Challenge. Grab your chance to have a risk-free go at Mr Fixit's £10 - £1,000 World Cup Challenge. Grab your chance to have a risk-free go at Mr Fixit's latest £10 - £1,000 Challenge.